This touching story about a single mother raising three children in 1949 stands in stark contrast to the materialism surrounding many modern-day Christmas celebrations. Though the drama is fictional, it is based on actual people and circumstances from Frank Garlock's childhood. He came from a poor family of nine children who sold their grandmother's homemade fudge to help support the family. To reinforce the story, this program includes traditional Christmas songs as well as new compositions by Frank Garlock and Ron Hamilton. 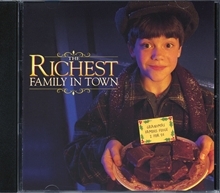 Your congregation is sure to be richer from having experienced your choir's presentation of The Richest Family in Town.